THE ALL-NEW CITROEN C3. WHATS NEW? 2017 is seeing an outburst of great new cars. Whether they are keeping up with competitors or attempting to leave them in the dust the level of detail and baseline specs are all really impressive. Where the supermini category is concerned we’ve seen vehicles that are jam-packed with infotainment systems and driver assistive add-ons that are almost drastically similar to the concept cars we were seeing a few years ago. The new 2017 Citroën C3 has gone beyond what you’d expect to see, quite literally… The C3 has had a body overhaul and stands out in the category for its appearance alone! So, that being said, we’re going to take a closer look at what’s actually new both externally as well as internally. The new C3 is very reminiscent of its bigger and older relative, the C4 Cactus. This similarity in itself makes the supermini stand out, it’s not often you’d see one that looks like an SUV ( a small one, but an SUV nonetheless). This isn’t the first time Citroën has stood out with their distinctive design, the 2CV, produced from 1948, was groundbreaking in its day and the new C3 has brought it back to its innovative best. Let’s start by taking a look at the exterior. As mentioned the C3 is reminiscent of its older sibling, The C4 Cactus, and it does this by borrowing elements of the chunk style. It less than 4 metres long, which makes it a great and practical parker, and it is wider and lower, which gives itself to the more squat and purposeful stance of the SUV type vehicles. One of the features that really makes this vehicle different is the appearance of the quirky but ingenious Air Bump, the rubber panelling featured down the flanks of the vehicle, which protect you from the dreaded carpark prang! A really smooth, fluid and modern feature to demonstrated flare and design focus is the placement of the front lights. Another classic feature of the C3 is the incorporation of the daytime runners into the front grille, along fluid rectangular wrap-around grille that incorporates the horizontal lines that appear throughout the vehicle and are made up of the extended lines of the chevron badge. Below this, you find the rectangular broad head-light and below this appears the colour block of the headlight, a very different way of incorporating the lighting system but a really stylish and bold way nonetheless. 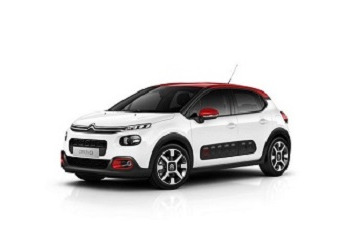 The C3 comes with 17” alloys as standard, with a floating roof design and the addition of dark tinted windows to enhance the flowing lines, it demonstrates the stylised, fluid and striking outline of a car that is made up of great and obvious quality. Citroën have a long and proud history of being stylish and quirky, demonstrating their ‘french flare’ through their design. The C3 showcases this confident image, with this bold and striking statement car, and really makes it stand out next to competitors. The wide palette of bold and unusual colours make this car more individual, personalising from 9 body colours, 2 Air Bumps colours, 3 roof colours and 3 interior trim colours you are given a whopping 162 combinations! Citroën has, like they have externally, approached the design of the interior very differently. The flare of the design does continue throughout but there is also a shift in core brand value to having a major focus on comfort. The C3 is the embodiment of a pleasurable driving experience, the driver and passengers held at the forefront of the designer's minds during development. And let's be honest, if you have an enjoyable and comfortable experience you’re going to remember it! So below the eye-catching yet subtle geometric design, sits a whole load of comfort-enabling features. An extremely versatile driving position, new seat structure and material are at the forefront of the actual, personal driving comfort. Engineers have incorporated a great deal of suspension, plus worked on the roll elements to make the drive itself a really smooth, calm and (you guessed it) comfortable experience! What more could you want when you’re on the move? Well, how about a personalised trim option? With 3 to choose from you can make an already impressive cabin style your own. The rectangular theme that appears a lot throughout the vehicle is also very apparent inside. The airvents for example, all set within a bold rectangular ribbon of colour and they themselves feature the rectangular trim, what we’re saying is that even the air vents are different, in a good way! A long broad dash accentuates the width of the vehicle, with plush and hard materials contrasting in a really smart, smooth and modern way. The dash is also very uncluttered, a refreshing feature which makes the C3 a really workable and contemporary addition. The appearance of pull handles instead of the bog standard incorporated door handles are just another small element that make a massive difference, you are fully aware that a lot of thought has gone into the design, even for the smallest design elements such as air vents and door handles! The actual material and layout is impressive. What’s new other than this bold and dominating style and comfort-focused trimmings? Well, the featured tech is really quite impressive. One of the most impressive is the built-in dashcam, which is programmed to record events leading up to and following a collision which obviously works to enable you to feel safer and secure on the roads especially where your insurance is concerned. Download an accompanying app on your smartphone and you have the ability to take videos and pictures of your road trip and share them online with your friends and family, including across all social media channels. The infotainment from mid-spec upwards, uses Citroën’s newest software with load’s of the latest connectivity including Apple CarPlay, Android Auto which mirrors your smartphone, including its sat-nav, onto the 7” touchscreen. It comes with DAB digital radio and Bluetooth and even controls the ventilation system and climate, though some may see this as a bit of a fiddle it is a fresh approach to decluttering the dashboard. The lower level trim really offers pretty decent package too, it comes with DAB radio, a lane departure warning system, cruise control and Bluetooth connectivity, Citroën have made each spec level really appealing and they successfully embody the elements of an 'all-rounder' vehicle. As with the rest of the vehicle, the flare and individuality continues into the overall driving experience. The stout figure of the C3 is no indication to its handling capabilities, they have worked to trim weight in the chassis to keep it under the definitions of a zippy supermini and to keep the weight the same as its predecessor even with the increased width at 1740mm.The great handling, improved suspension and cornering makes the C3 a really enjoyable drive experience. And, whilst having its dominant and striking face it’s really easily handled into even the smaller spaces. Overall, the driving experience in the new C3 is really very pleasant, the tick boxes of unobtrusive engine noise, agility in towns and the ability to maintain comfortable motor speed are all there, present and ticked!